House on Cape Cod 12/21/11 | Joseph Bergin Architect P.C. Our first post about this project was just last week. We showed a rendering of the street facade and a photograph of the vacant building lot. If you’ve recently seen that post, please don’t be confused…there has not been this much progress in that short period of time; please recall that the photo we showed of the vacant land was snapped in mid-October. But for two months time, this is certainly good progress. Since the staked out footprint, much has been accomplished. The footings and foundation were excavated to a deep basement level. The footings were formed, reinforcement placed, concrete poured and allowed to partially cure. Then the foundation was formed, reinforced, poured and cured sufficiently to support the first floor framing system. 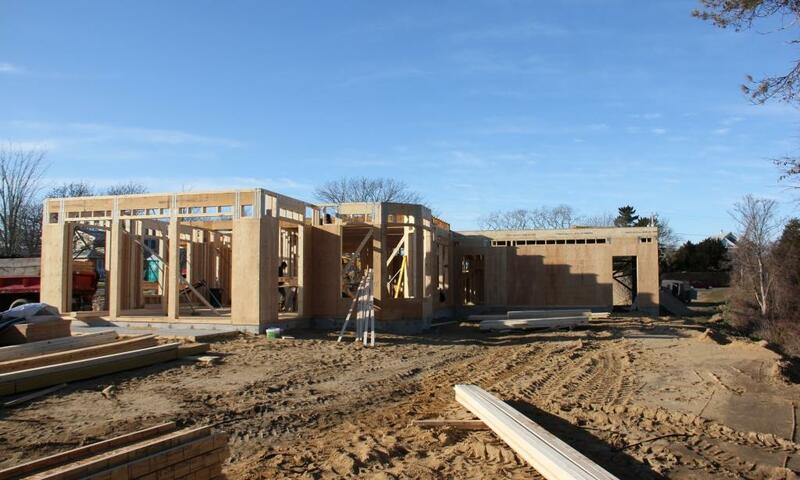 The first floor joists were laid out and secured, hold downs installed along with other necessary mechanical fastening, the floor sheathing was affixed and then the foundation was backfilled. The first floor exterior walls and interior partition framing was erected and partially sheathed to achieve braced bearing walls. That’s quite a bit of activity. Presently, the second floor joists are being installed. 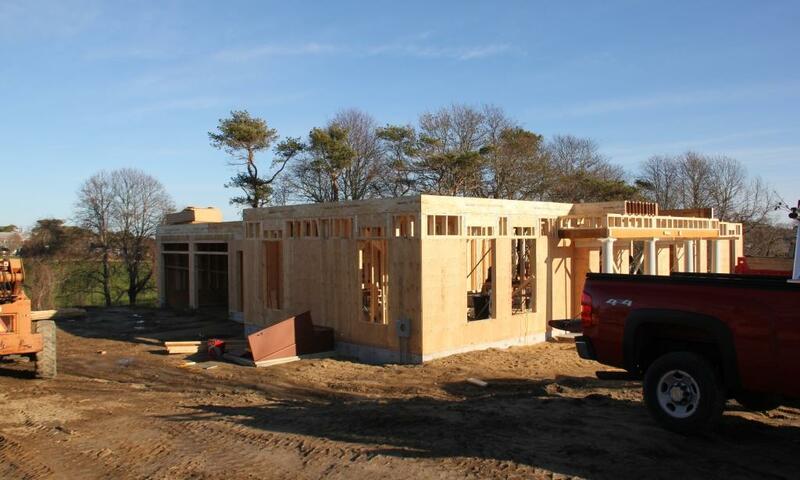 Soon the gable walls and roof framing will be under way, and the form of the building will begin to emerge. 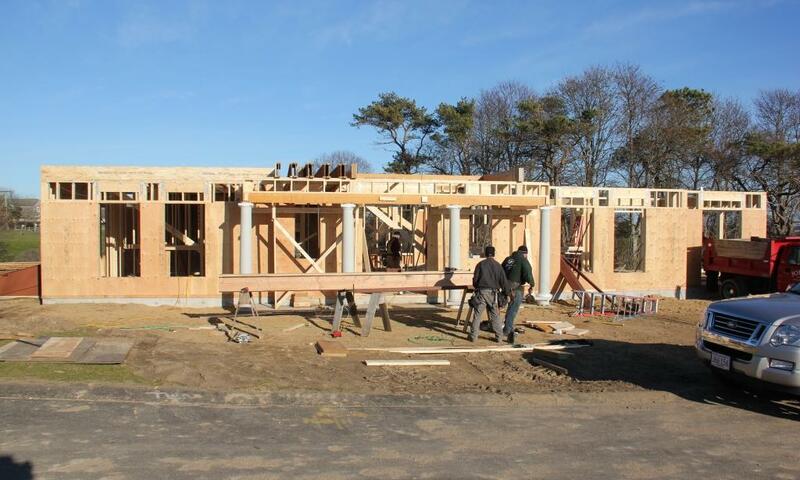 Once the sheathing is fully affixed, the form will be undeniable. I especially enjoy that moment in a project. There is a purity of form that comes through, and a real unveiling to the world of what has been cultivating in my mind’s eye for quite some time to that point. Well, maybe not the world. But it is certainly an unveiling to the homeowner…and to the community! Wood framing is an art and a science. Its outcome is so influential to the outcome of the project as a whole. It literally is the skeletal system of the building; the fleshing out of a well proportioned design relies so much upon the framing work having been executed with care and awareness. Good builders know that framing must be executed with the end in mind. I could really digress here; I am teeming with thoughts to share, but I will save those thoughts for a later post, else this one will get too long. This post means to convey project progress, not ruminations. The above photo is a view to the rear of the house. The house will be opened to the rear and side yards quite generously by an abundance of french doors and large windows. This will support a strong relationship between the exterior and the interior and blur the boundary between indoor living and outdoor living. A large terrace will contribute, as will a swimming pool. I can’t wait to see the gable walls, dormers and main roof! Check back again soon…once it is all formed, we will post new photos!